I mentioned in my faux leather belt posts that I had some projects in mind when I purchased this faux leather at the Home Decor Store. I fell in love with how soft the back of the material was, and I loved that it was thin and would be fairly easy to sew. This is the very project that I was planning on making. I had found a really simple template for baby booties on Martha Stewart. 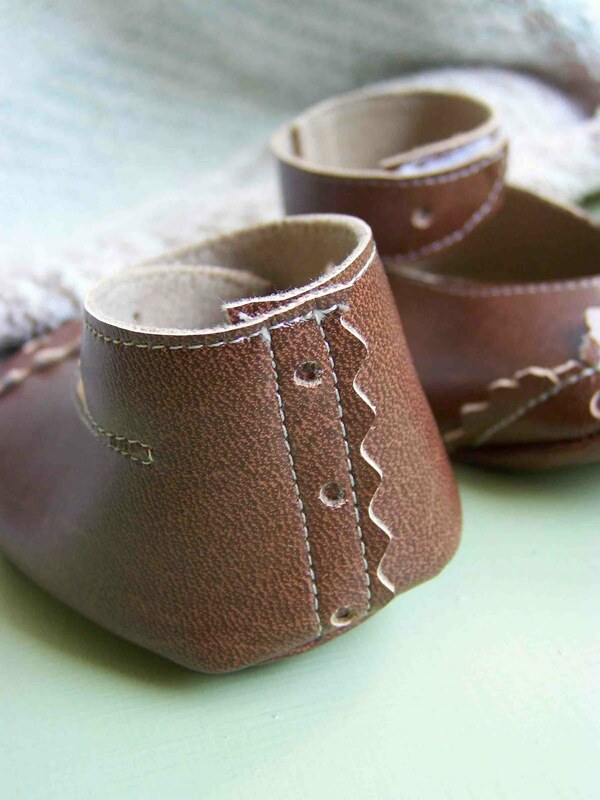 Her instructions were intended for felt baby booties, but this faux leather worked perfectly. The inside lining was super soft, and I didn't have to worry about finishing off the edges. I was pleased at how easy the material fed through my machine (I didn't even have to use a special needle). Ruffles seem to be quite in right now, especially for babies. You find them on onesies, headbands, shirts, and even shoes. I wasn't quite convinced that the faux leather would gather well, but it did. Hooray! I used an all-purpose thread, but I am sure that a heavy duty thread would have been even better. 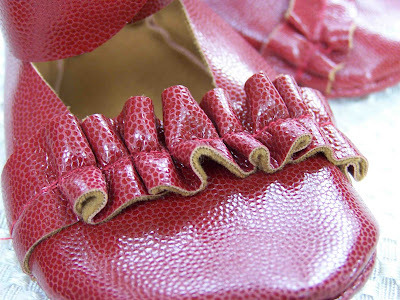 I created the ruffle, sewed it onto my shoe piece, and then attached the shoe to the sole. It worked like a dream. I tried to leave about 1/2" of ungathered material on either end so I wouldn't have to fight the bulk of the material when seaming together the booties. After creating my punched leather belt, I couldn't help but make a pair of wing-tip inspired booties. I traced the end of the top bootie pattern piece and designed a shape that I liked. I then worked out a pattern of punches that I was satisfied with. I then cut my pieces of faux leather, transferred the punch pattern, and put my leather punch to work. As you can tell I as I got going I decided to omit some punches that I had planned on. I also should have factored more spacing for the seam allowance when determining punch placement. I used a pinking blade on my rotary cutter and pinked both the edge of the back seam of the booties, and the top of my tip piece (pinking shears would have worked better for this project). I added a couple of punches along the straps of the baby booties and did some topstitching along of the edges of the shoe. This is definitely a first attempt, and needs some adjustment before I gift them, but I kind of adore them. 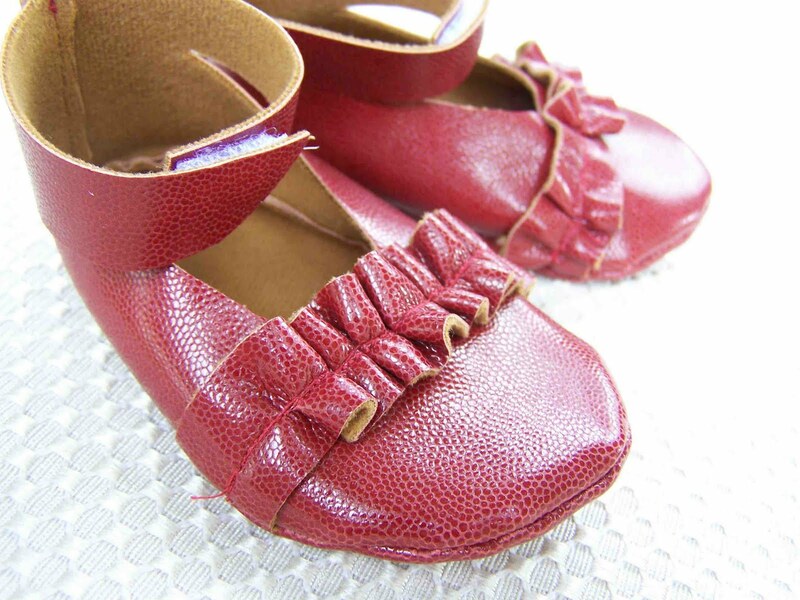 What fancy lady doesn't want a pair of red soled shoes. I couldn't help but make this pair (plus I ran out of black material). I kept this pair of booties pretty basic. 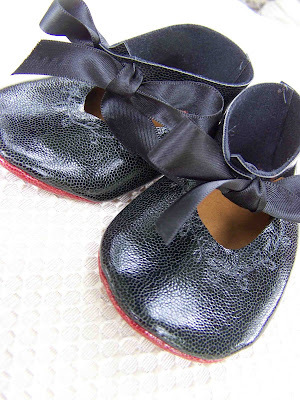 I added some decorative stitching to the top of the booties, and punched a couple of holes to ends of each strap. I used a black satin ribbon to tie them. Don't forget the fray check on the ends of the ribbon. Now I need to find the perfect little lady for these. 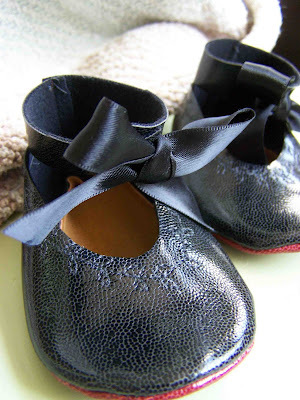 These baby booties were so quick to make. Any level of sewer could easily tackle this project. 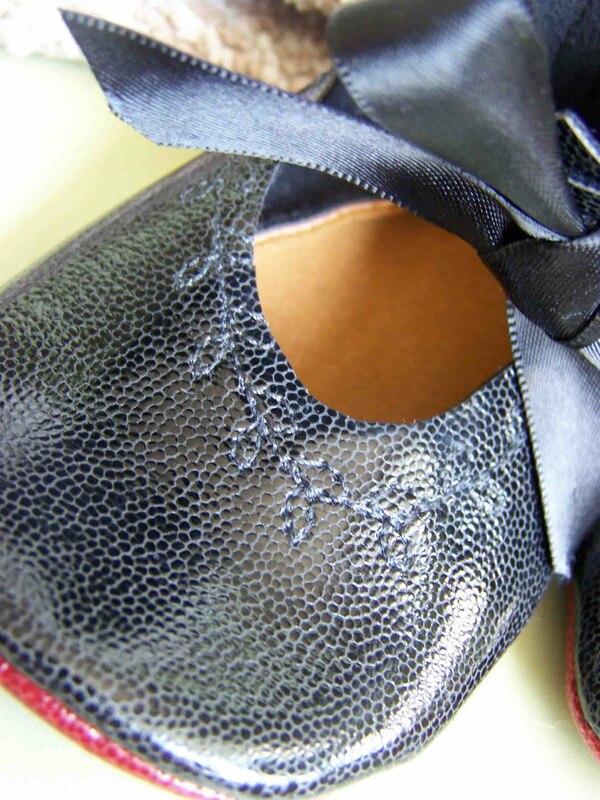 The baby bootie template that is provided is not to size. I compared it to an existing baby bootie pattern that I had and made adjustments. Click here to check out the great link parties I'm participating in today. Hopped over from It's So Very Cheri and what did I find? 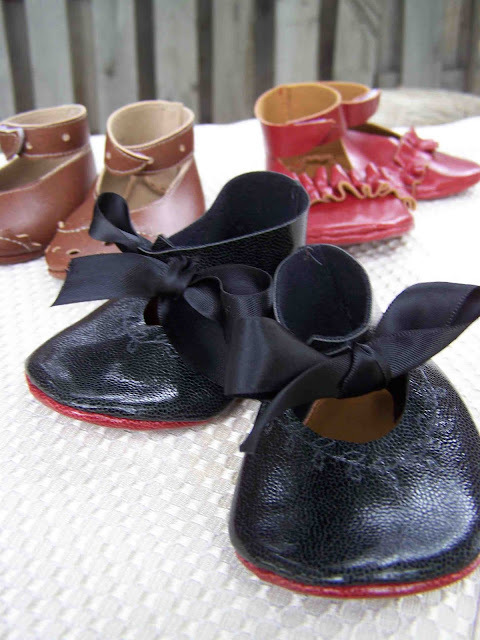 The most adorable baby shoe's ever!!!! I just LOVE these! You've inspired me to create some for my young-un! Thanks for linking up to my Everything Nice Baby Girl Link Party! I love them! I've been searching out new bootie styles lately (my best friend just had a girl) and I think these are my favorite so far. I absolutely love these! The red ones are my fave, I love me some ruffles! You are very talented! I love these! the 3 of them! They look so professionnal, it's amazing! 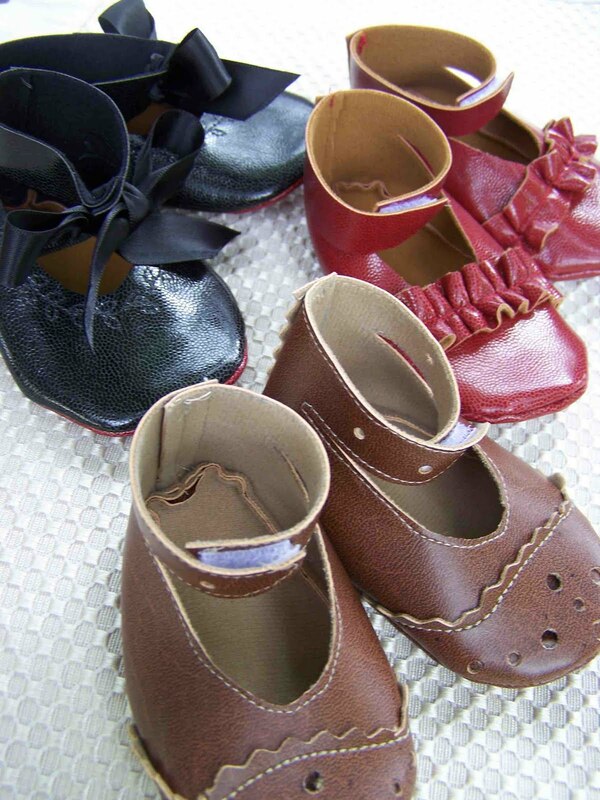 YOU COULD START A BABY SHOO SHOP!!! These are way 2 cute! Thanx for this great idea! Love the leather you used!!!! 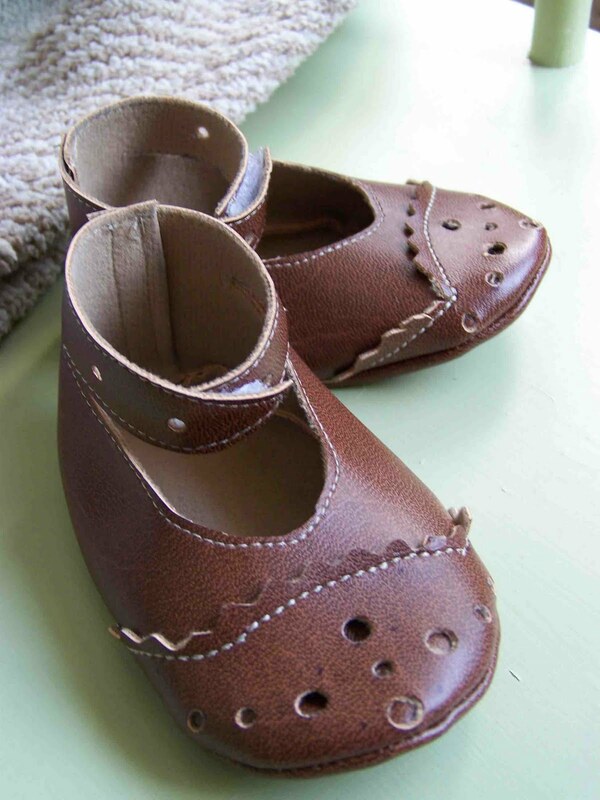 I have been wanting to make these for ages, but I haven't found the *perfect* materials at our local thrift shops. I do adore yours though. And those wing tips? Super awesome! Thanks for sharing. OH My goodness those are absolutely precious!!! Your blog inspired me this week....too bad my girls are half grown, these are the sweetest little shoes!! Love these. I needed some non-leather baby shoe ideas too! I'm featuring you this week at Craftastic Monday - be sure to grab a Featured button! Thanks for sharing that link to the template. I will have to make some of these for gifts. Tricia these are too cute, and what a great baby shower gift to give. How much more original cal you get right. Oh man I have a few baby showers coming up, and I really want to make the gifts, seriously thinking about this. THANKS for a great tutorial, and inspirational pics.